Several old favorites are being reissued this month. 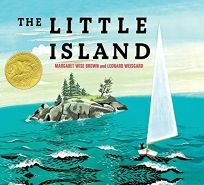 The Caldecott Medal-winning The Little Island by Margaret Wise Brown, illus. by Leonard Weisgard, tells about the seasons and animals that touch a small island (""There was a little Island in the ocean./ Around it the winds blew/ And the birds flew/ And the tides rose and fell on the shore""), and a kitten who comes ashore learns a secret about the island and a lesson about faith.